Shopping in Agra covers an array of things. Find out shopping attractions of Agra, India. A shopper's paradise for those who love to buy specialties of the place as souvenirs and keepsakes or as gifts for their loved ones, Agra offers mini Taj replicas in various sizes for the tourists. This white-marble Taj is often used as decorative items in the homes and are considered to bring good luck for the lovers. However, the 'marble' can be actually the fake - a stone called 'Talk', which looks like marble, with the exception that it is not opaque like the real one. It is quite cheaper too. So, one should be careful about the quality while buying the Taj replica and pay only the right price. 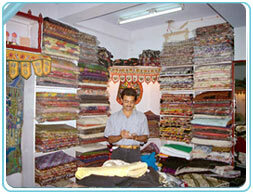 Leather items at Agra are famous for their quality. These include leather sandals, purses, bags and decorative items. There are lots of handicraft emporiums that offer a variety of sandalwood and rose wood items along with brass decorative pieces and stone carved images. The fine work done by the local artisans in the city is notable and the markets of Agra are the best place to explore exquisite piece of fine Zari embroidery work, stone inlay work, durries and carpets. One can find most of the big emporiums concentrated in the Gangotri at Taj complex, Sadar Bazaar and Sanjay Place. Yet, those who can steer through the narrow lanes of the city markets of Kinari Bazaar, Raja Mandi, Fuhaara and Lohamandi can get their hands on the best bargains at dirt cheap prices. One can also try Petha (sweet) and Dalmoth (salty), the famous delicacies of Agra. Petha is good for summers and can last for about a month.